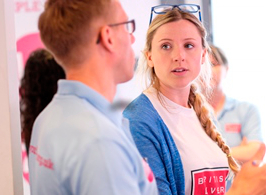 Our Love Your Liver Corporate Awareness Day includes a range of quick and easy health checks, such as blood pressure, BMI, total body fat and visceral fat measurements. We also include a nutritional review, units of alcohol activity, hepatitis awareness and our liver health screener. Attendees will receive their own results and support and advice on any potential health issues. For more information and costs see our information sheet, email andy@britishlivertrust.org.uk to book your day. If you would like to hold a liver health awareness event in your workplace or college, we have a wide range of materials you can order to support your event. We are happy to support you - get in touch to let us know what you are planning - email us at loveyourliver@britishlivertrust.org.uk to discuss your plans. The British Liver Trust mobile screening unit can visit your workplace to stage a Love Your Liver screening and scanning event. Participants will be able to take our liver health screener, and be offered a FibroScan check to assess their liver health. Support and information on any potential health issues will be provided. The Trust will organise all the logistical aspects of the day, and attend and run the event.